Mani was a Redguard whose family recently took over the Frostflow Lighthouse after moving from Hammerfell. Unhappy with life in Skyrim, he was planning to return to Hammerfell once his father Habd returned from town. Unfortunately, before that could happen Falmer lurking within Frostflow Abyss finished tunneling into the lighthouse cellar and attacked the family. His mother Ramati was killed instantly and they dragged him and his sister Sudi into the Abyss before killing him. 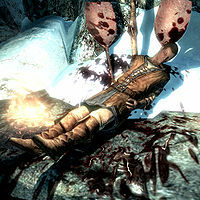 His body can be found near the Abyss entrance, impaled by a Falmer sword. Mani wore a set of farm clothes along with a pair of boots. He carried an iron dagger and a torch.